The Wildcats begin their chant before taking the field. Two men, the same position on paper, join the huddle. One is a twitchy 5-feet-9-inch, 170 lb lightning strike, appearing seemingly out of nowhere. The other is a dominating 6-feet-2-inch, 225 lb. roll of thunder, catching unimaginable passes. The first, catching and carrying the ball in one swift move, maneuvering and reading the field end to end in a matter of seconds. The latter, catching pass after pass, moving the team 80 yards one precise, bulldozing play at a time. Senior wide receivers Jonathan Epps and Cedric Gilbert are, respectively, the lightning and thunder of ACU football. “I’m more of a finesse, quick twitch guy so we try to match me up on linebackers and put me on bigger and slower guys and take advantage of that, whereas Ced (Gilbert) is a big receiver all around, go up and get the ball. If we need a big catch we lean on him to get that,” Epps said. Epps and Gilbert share another common bond: both played two years at junior colleges, honing their skills some, but also learning about the bigger picture that is the game of football. “My first year I didn’t really have a receivers coach; second year we had one but he more just taught us how to get open and stuff, so I’ve gotten a lot better since then,” Gilbert said, who played at Cisco College. Both athletes had successful juco careers, with Gilbert catching 36 passes for 658 yards and six touchdowns in his freshman year as well as garnering 27 passes for 278 yards and two touchdowns in just eight games his sophomore year. Epps moved to wide receiver his sophomore year at Tyler Junior College, where he finished with 26 catches for 322 yards and one score. He also helped lead the team to a bowl game victory to finish the season. Both men quickly realized the difference in Div. I football once they arrived at ACU. “You’re going to have people on the field that are on scholarship like you are, that are as good as you are so you really gotta have that passion, that discipline, and the want to do good,” Gilbert said. 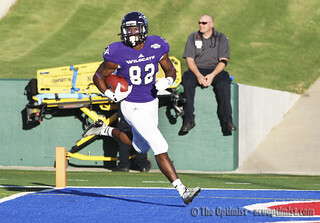 Both Epps and Gilbert quickly learned to appreciate the methods at ACU, translating that to the field every Saturday. It all comes back to the team environment. From the protective offensive line to the oddest pair of wide receivers, the group mindset is evident. “I think we make a pretty difficult team for the defense because trying to cover me and Jonathan, especially when we’re on both sides, if you move the wrong way you pretty much get toasted,” Gilbert said. 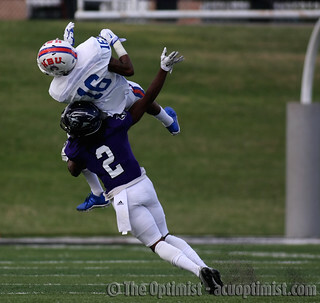 Epps and Gilbert both have racked up Southland Conference accolades; Gilbert earning second-team all-Southland Conference in 2014 and first-team pre-season all-Southland Conference for the current season, and Epps getting second-team all-Southland Conference in 2014 for return specialist as well as second-team all-Southland Conference as a return specialist this season. In three games this season, Gilbert has 17 catches for 256 yards and three touchdowns while Epps has 16 catches for 163 yards and two touchdowns, as well as four catches for 50 yards on punt returns. Both are focused on finding more success on the field in their last college season, but have their sites set on graduation and possibly the league. Gilbert, aiming for the NFL combine or Canadian league, anything to further his time with the game. Epps, more open, determined to graduate and see where the future takes him. Almost ironically fitting for the duo: Gilbert knows the call and route, determined to accomplish the plan laid out, Epps waiting to see where the ball falls, ready to react and take the route he best sees fit in that moment.